Barb Wire Leather Cords 2.5mm round, regular color - sky blue. 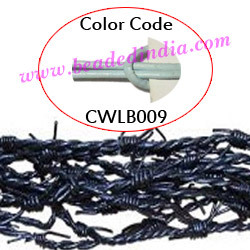 supper quality 2.5mm round barbed wire leather cords, regular color - sky blue as per the photograph, pack of 25 meters. Barb Wire Leather Cords 1.5mm round, regular color - magenta. Barb Wire Leather Cords 1.5mm round, metallic color - magenta. Leather Cords 2.0mm (two mm) round, metallic color - green. Parad Mercury Lord Ganesha Statue 100 grams. Leather Cords 2.0mm flat, regular color - bottle green. Parad Mercury Lord Shiva Statue 60 grams.